Enjoy the peace, quiet, and natural beauty of this 1,241-acre site in Millstone & Roosevelt while angling for bass or catfish in the lake. Watercraft can be launched into the lake where visitors can canoe, kayak, and fish (car top, electric powered boats only). Lake access is on Perrineville Road/Sweetman's Lane (between Agress Road & Millstone Road). In addition to access to the lake, there are two trails. The Lakeside Loop is a 1.5 mile multi-use trail on Agress Road. The Pine Creek Trail is a 1 mile unpaved multi-use trail on Baird Road. (See park map below for parking locations). Portions of the park west of Agress Road are currently in the planning phases for future trail/facility development. 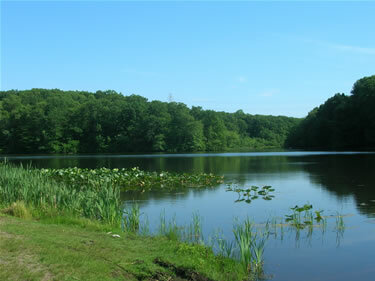 Perrineville Lake Park is located on Perrineville Road/Sweetmans Lane (County Route 1) in Millstone Township. From the Garden State Parkway or the NJ Turnpike, take Interstate 195 to Exit 16 (Route 537, Freehold). Rt 537 East for 1/2 mile to Route 571. Turn left (north) onto Millstone Road (Route 571) and proceed north 3 1/2 miles to intersection of Millstone Road and Perrineville Road/Sweetman's Lane. Turn left and proceed 1/2 mile west to lake. From Highway 33, travel West (towards Millstone). Pass Luchento's Country Italian Ristorante and exit right, following signs to Millstone. Make first left to cross over Hwy 33. Follow Millstone Road to Sweetman's Lane. Turn right and follow to gravel lot near lake. Follow above directions from Sweetman's Lane. Continue past lake. Turn left onto Agress Road. Parking lot is on left. From Sweetman's Lane; continue past lake and turn right onto Baird Road. Parking lot is on right. From Millstone Road; heading south, turn right onto Baird Road. Heading north, turn left onto Baird Road. Parking lot is on left.